Very pleased to have been referred to Dr.Jason Yip. He's personable and takes time with his patients. I will certainly continueto see him for any future gastroenterological needs. Very pleased to have been referred to Dr.Jason Yip. He's personable and takes time with his patients. I will certainly continue to see him for any future gastroenterological needs. I thought Jason was a great guy. I only seen him for consultation only. Easy to speak with and listens toany questions you might have. 10 years ago I had a procedure done by his dad, and all went well. I thought Jason was a great guy. I only seen him for consultation only. Easy to speak with and listens to any questions you might have. 10 years ago I hada procedure done by his dad, and all went well. **PLEASE BE ADVISED: IF YOU HAVE AN HMO INSURANCE PLAN, YOU MUST CALL THE OFFICE BEFORE YOUR APPOINTMENT SO WE CAN CONFIRM YOUR PRIOR AUTHORIZATION! 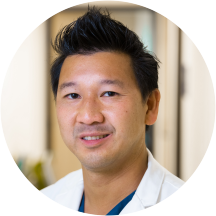 ** Dr. Jason Yip is an energetic, caring gastroenterologist treating patients in Anaheim, California, and the surrounding communities. His approach to practice is to treat each of his patients as he would members of his own family, and he makes sure to take the time to provide care that is both competent and clearly explained. Dr. Yip holds certification from the American Board of Internal Medicine for gastroenterology and is a member of professional organizations including the American College of Gastroenterology and the American Gastroenterological Association. Having grown up in Orange County, Dr. Yip attended the University of California, Berkley for his undergraduate degree. He pursued his medical degree at the University of Washington School of Medicine. Dr. Yip continued his medical education at the Mount Sinai School of Medicine, where he completed an internship and received his residency training. He then completed a fellowship program in Gastroenterology at the Tufts Medical Center. Patients visiting Dr. Yip can receive a full range of gastroenterological services. He provides colon cancer screenings, colonoscopy, upper endoscopies, general consultations, hemorrhoid banding, and advanced procedures such as ERCP. Treatment is available for issues including abdominal pain, hemorrhoids, rectal bleeding, biliary disease, and acid reflux. When he is not treating patients, Dr. Yip enjoys playing Ultimate Frisbee, cooking his own Chinese food recipes, eating sushi, and spending time with his wife and children. Yip JS, Woodward M, Abreu MT, Sparrow MP. How are azathioprine and 6- mercaptopurine dosed by gastroenterologists? Results of a survey of clinical practice. Inflammatory Bowel Disease. 2008 Apr; 14(4): 514-8. Yip, JS, Nguyen PT. Comparison of EUS Visualization of 2 Linear Endoscopes in Vascular Staging. J Invest Med/ Western Regional Meeting, Volume: 51 2003. This is my first time visited, too soon to do the survey, I will write the surveys later. Dr. Yip was compassionate and took time to answer my questions. I appreciated the time he took with me during my visit. Dr Yip walked in with a big smile and that meant a lot!!! He’s very polite and respectful and cares about what you have to say and how you feel. He plans your medical treatment with your input! I left therewith ease and no doubt that I was in good hands Thank you Dr.Yip and friendly hard working staff!!! The staff was great and were very knowledgeable. Dr. Yip is personable and made me feel comfortable with the entire process. I was a little late to my appointment and they were very busy. I don't have a life due to my illness so the wait was fine with me. I was referred to Jason because of his good bedside manner sincemy other GIs have lacked that to the point of being rude and mean. Another huge difference between he and others is that he stated that he can't help me but referred me to a specialist and his office faxed that request while I was in my visit. Other GIs have required me to go back to my PCP to have them do it or have just said that they were going to refer me and then made me make an appointment to do that before the request was submitted. Dr. Jason Yip had bedside manner,he had the time to fully explain my condition,and treatment plan. Very pleased with him and his office staff. Dr. Yip explained the procedure and so far I am very satisfied with the results. Great doctor! Very attentive. Told me straight up he doesn't know what's wrong; which I appreciate instead of other doctors saying there's nothing wrong. I was very pleased that they called me right back and I got an appointment the same day for my consultation. I would recommend Dr Yip to my friends. I waited about 15 minutes,get call inside and wait for Dr Yip for 15-20 minutes,he answers all my questions that I want to know. Very knowledgeable and patient. Took time to answer any questions. Dr. Yip is very kind and professional. Understood the severity of my condition and is treating it as such. Very happy! It was an excellent experience with friendly staff. Wet personable and knowledgeable. Listened to my needs and worries. Waiting in the room is little bit too long. But Dr Yip is very nice, apologize for the long wait, and listen to your concern. Dr Jason Yip is a very friendly and charismatic physician. He has always been very pleasant to communicate with and understood the issues well. I came in feeling tired & out of breath & the nice young lady at the front desk, brought me a cup of water, which was just what I needed. Both times I have seen Dr Jason Yip he has been very kind and courteous. I would highly recommend him, he makes you feel very comfortable the way he talks to you and asks questions. Doctor was very straight forward and easy to understand his diagnosis. Great experience! Listens to patients concerns. Overall would highly recommend. The best experience I have had as a new patient. Friendly, helpful, and efficient staff! Super attentive and compassionate doctor! Such a great experience! Thank you all. Dr. Jason Yip was easy to talk to/with, attentive, verified what he heard me say, and informative in answering my questions. Dr. was very professional and likeable! Very compassionate, thorough and kind. Consummate professional. Dr. Jason is an Excellent and very knowledgeable doctor. Dr. Jason Yip was very helpful in treating my medical condition. I look forward to future visits with him. I feel that he a very excellent doctor. Dr Jason Yip is excellent physician, great people skills. The wait is not out of the ordinary for any physician who gives each patient individualized attn, especially during a crisis. He has good dr referrals if you have more critical healthproblems. He will call the other physician right from his personal cell phone while you're in the office. His staff is very courteous, efficient and professional. Been there twice, once for my husband and once for me.